In true spring fashion, a cold front barreled on through just after it hit 65 degrees, making it feel once again like January. It even snowed. Yep. Told ya! Luckily the sun came out and melted it by the time we left school. I wasn't totally bummed about the cold, though, since it meant I could finally wear this outfit. It's one I thought of back in January and never got to! 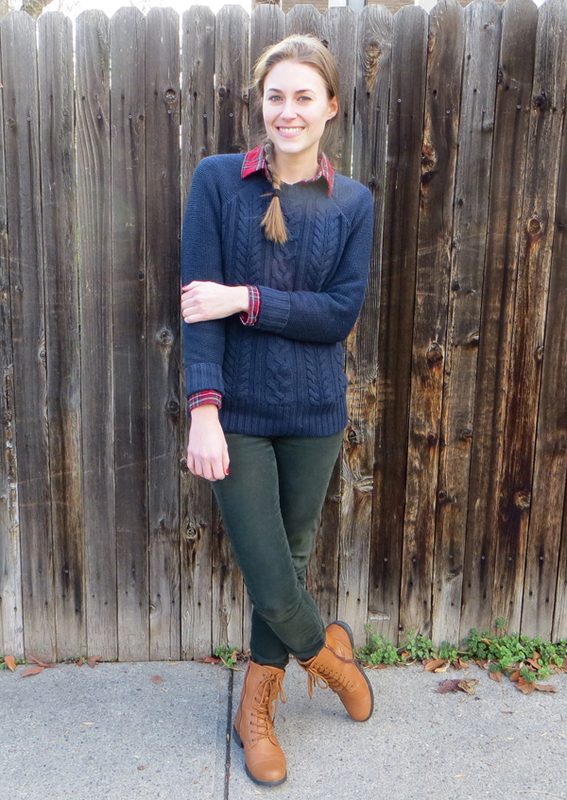 I thought my red flannel and green pants would look too Christmas-y, so I layered a navy sweater over it. I love how the flannel ties together the navy and the green. Two hours after I published my last post and wrote about how I had forgotten what I wanted to write about, I remembered what it was I wanted to write about. Funny how that works! I definitely need to keep more notes for future posts. I never really had a plan for this one, though. I always want to talk about the weather, mostly because I'm studying it, but I realized that everyone talks about the weather. Every single outfit post I read on other blogs talks a bit about the weather! Of course, it's because the weather controls what we wear on any given day. I'll try to think of more interesting things to say in future posts, but I can't promise that I'll avoid the weather. Not much else is going on besides school. We are finishing up our spring break, and I only took a couple of days off of research. Back to the grind on Monday!